I'm currently having an issue with overspin when using a m100 spring when using an 11.1v 15c lipo I get overspin. Any suggestions as to how to prevent this? I cant go over 328FPS so any help or directions are welcomed. Better option would be Fit a mosfet with active brake. How do you know thats the better option? Have you ever fitted or used a mosfet with active brake? Do you know what motor he has inside? Active braking increases motor stress and if he has a cheap naff motor it will get very hot and die quickly. Be careful with advice especially when it involves someone else's money. Ideally I want to increase the ROF in the long run also. If you want a higher RoF and you already run an 11.1v LiPo then you're going to need lower ratio gears (probably 13:1). OK let me rephrase that In my Opinion that would be the better option. So trying to touch on everyone's questions and comments. The Krytac's have a fet but no active break so this will need to be swapped out for something else (I use an AB on my current main but I'm happy to spend some extra money to get a really tight setup linking to the trigger if there are options worth exploring. Krytac LVOA spec to note. 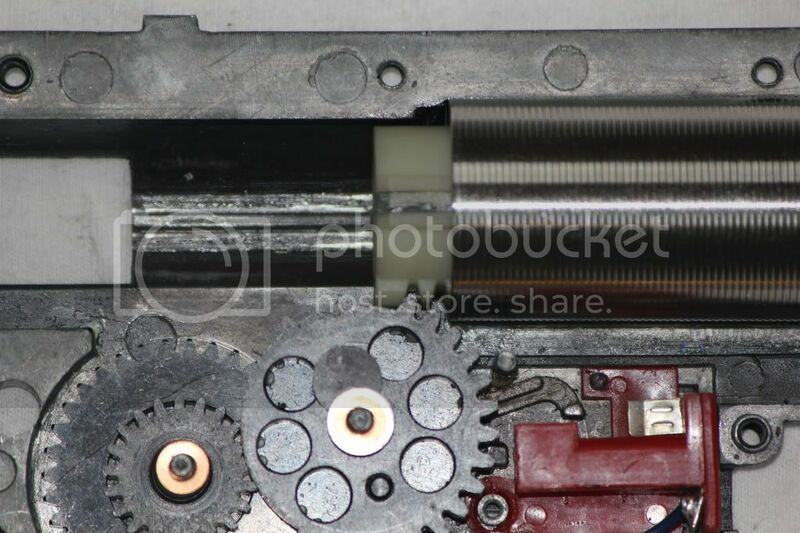 In relation to overspin I am seeing the piston moving to a position that is beginning to compress the spring again. plus is this gun firing like this on a fresh off charge 11.1v ??? but after a while from say a fresh 12.6v it starts to behave itself a bit better at 11.1v ??? As SD said if you are only getting slight overspin leave it alone. A lot of guns get slight overspin on a fresh battery its only when it starts double firing its an issue. Very few guns actually require an AB fet and most people who have them would be better served with a non-braking fet as AB fets shorten motor life. So fitting one to a gun that doesn't require it is kind of daft as you are gaining nothing except a bill for a new motor sooner than is necessary. Any suggestions of tell tale signs of pending danger when im out placing? I picked up a new 7.4 today so ill give it a go with both and see how I get on. a little bit of overspin is 100% normal, if you're double firing then you've got issues but otherwise leave it alone. Gonna take this out for a spin on Wednesday evening try the 11.1 and 7.4 in the order advised and see how I go. If there is trouble at least I know something has to be done. if not ill hold on until service time. how about getting a WBB and then fitting an M150 spring, the 30k motor will be able to cycle it on an 11.1v LiPo and you'll then not have any overspin issues! Making a wbb work well on an aeg is never that simple because volume not just pressure is an issue, but it is worth it when its all working right. The Ultimate cnc 30k motor would be better its a bit torquier and doesn't lose trigger response as much with a heavy spring. The Krytacs were designed to be able to pull an m150 spring and my SPR had no issues with the Orga 6.23 WBB and shot at pretty much bang on 350 fps with it so I imagine that the CRB would be fine too. Thats interesting because when I tried the same thing with my crb it was all over the place. I had poor consistency with the fps and accuracy. I did plan on trying to get it working properly but killed it before I had chance. I also found that the 30k motor did slow a bit with a heavier spring, not much but enough to bug me when spamming the trigger. The Ultimate motor performs better and is only £60 so cheaper than than the krytac 30k if anyone with a 20k wants to upgrade. Aye... I wish I'd done more research on motors before buying the 30k Krytac one, lesson learned though. Took the LVOA out for a spin last night. With a 7.4v and the m100(at least thats what I think is in there) it felt a little underpowered so I cant wait to chrono it this evening. Tried an 11.1v and after 3 shots on semi she locked up, I managed to get it free by switching to auto thankfully. Went back to semi and tried a few more shots but within 10-15 rounds she has started to double fire so I decided to drop back in the 7.4v right away. I am secretly hoping the chrono results from tonight are poor and ill try a heavier spring and the 11.1 yay!